Sliding barn doors are all the rage in modern homes across the nation. However, they can be extremely expensive to purchase. Luckily, you can make a DIY barn door for a fraction of the price, and you’ll have completely creative freedom to make a door that complements your home decor. Whether you’re going for a rustic, barn-like look or a modern twist, these simple tutorials will give you the inspiration you need to get started! You can’t go wrong with this classic “X” pattern barn door, especially if you have a home decor that is rustic chic! Since the wood is stained, there are endless options for color, depending on the look you’re going for. With minimal materials and a minimal cost, this DIY barn door is great for beginners or people on a budget. 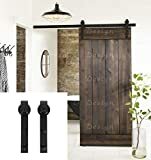 For just $20 more, you can achieve a gorgeous double door look to add to a doorway in your home. The process is just as easy, but the effects are spectacular! This project would be perfect for a walk-in closet or laundry room. If you’re looking for a more modern look, this is the door to make. Its sleek design with metal accents is perfect for a classy kitchen, living room, or closet. 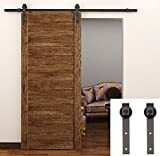 Made with just six 2×8 wood boards, a flat steel bar, and a few screws, this door is both economical and easy to make. The simplicity of the modern sliding barn door makes it a great project for a beginner. This DIY barn door tutorial uses exterior house siding instead of individual boards, which makes this project even easier. Chalk paint is used to finish the wood, but you can use stain or door paint to fit your room’s personal style. 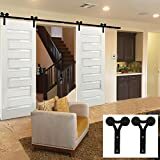 If you need double doors for a large doorway, this DIY barn door hardware tutorial is for you. Chevron is a very popular design for teens’ and children’s rooms. The varying wood textures, in addition to the angled placement of the boards, makes this DIY sliding barn door beautiful and different. Using recycled pallet wood is cost-effective and environmentally friendly. Since this door is not stained, each one you make will be unique! Made completely out of 1×6 boards, this modern sliding barn door is simple to make. It has five cut-out sections that give this door a different look than other sliding barn doors. Since it also requires only a few tools, you can rest assured you won’t be spending a fortune to build this stylish DIY barn door. Although this is technically a sliding barn door, it doesn’t look anything like one! Elegant, simple lines, metal trim, and a large door handle give this door a futuristic flair that any modern homeowner can appreciate. Another original project for your home that can help with redefining space and also offering you options in personalizing a large room, is this DIY room divider tutorial collection. This DIY barn door is classically designed and beautifully rustic. The sliding hardware is mounted onto a header board, which gives the rail more stability and even more charm. Diagonal accents, black hardware, and a rich stain will make this door one you cherish for generations. If you need an antique chic look to your barn door, this project is perfect! Antique white paint is used in the video, but you could paint it with chalk paint and distress the wood for an even more antiqued look. These beautiful large sliding doors would make an impressive entry to a living room or study. Painted a crisp white with diagonal trim accents, these doors give the impression of a rich life in the countryside. Building a barn door takes some time and effort, but the results will give you a unique piece you can admire for years. I hope this list will inspire you to get creative and tackle one of these projects. Comment below with thoughts or suggestions you have for other DIY barn door tutorials!